Google Ads is Google’s paid section of google.com. These are the results you see at the top and bottom of search engine results marked as “Ad”. They are run off of Google Ads’ bidding system and are managed through a Google Ads account. At Katy Digital Marketing we are Google Ads experts and we love getting the chance to help our clients optimize their Google Ads campaigns to get the highest click-through-rates, conversions, and impressions possible. Why Google Ads (Formerly AdWords)? Just like our Facebook Ads Management services, Google AdWords also lets you get pretty specific with the targeting of ads. We are able to target specific areas where your customers are most likely to be and to make sure we aren’t advertising to people that are irrelevant to your business. The most important part of Google Ads however, is the keyword targeting. Google currently controls 80% of all searches on the internet, so making sure you rank on the keywords relevant to your business is something every business needs. 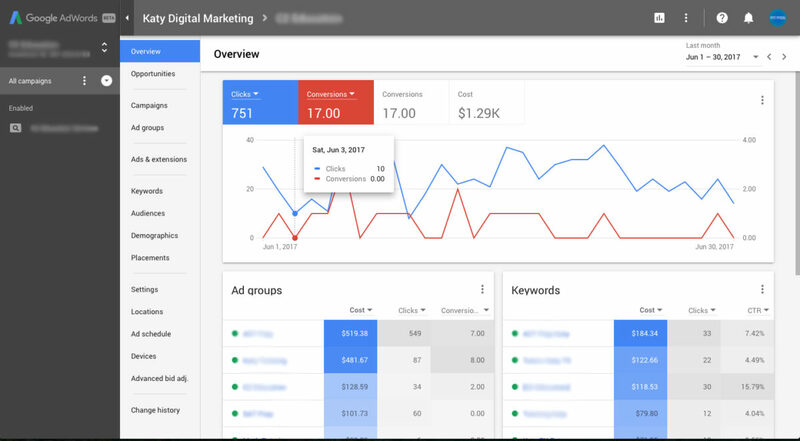 We are able to use Google Ads to bid and compete for the top spots on hundreds of different keyword searches, which is why Google Ads management is part of our Comprehensive Digital Marketing Package.